The launch of the Nexus 10 tablet has brought a new Android version into this world – please meet Android 4.2 Jelly Bean. Strangely enough the new Android version does not come with a new code name – it still comes with the Jelly Beanname just like its predecessor Android 4.1, although it was previously known as Key Lime Pie. Despite this lack of a name change, Android 4.2 brings a number of improvements – a new mode to its camera interface, a smarter keyboard interface that supports gesture typing, multiple user accounts that allow users to share the device and a “quick settings” section that allows you to switch between user accounts, toggle Wi-Fi and Bluetooth, adjust brightness and others. The Photo Gallery has been revamped a bit too – it now includes Photo Sphere – a new application that lets you create 360-degree panoramic photos that you can share on Google Maps, Google+ and others. In addition Android 4.2now offers gesture typing, an update to Google Now that now adds cards for flight information, restaurant reservations, hotel confirmations and others, support for Miracast wireless displays, seamless HDMI sharing for larger screens, widgets, new productive screensavers and a faster overall experience. 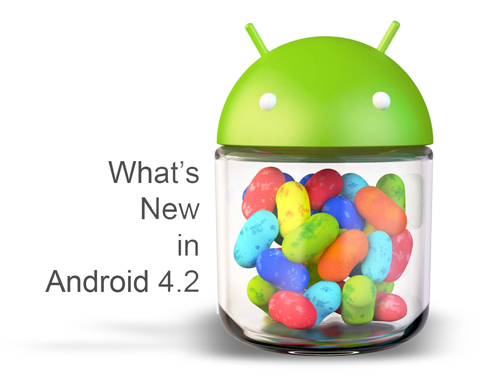 Android 4.2 will make a larger market appearance later this year and especially in 2013.